Pest controlling has more and more become a highly complex service business, no longer being a mere matter of setting traps or placing baits but meanwhile also including making service contracts to ensure that the trap systems in the infested buildings will be checked and equipped on a regular basis. Moreover, comprehensive regular documentation is mandatory for the pest controller as well as for his customer. Pest controllers with a big customer base nowadays can’t do without consistently being supported by software. For this reason, many of them use the ERP system Microsoft Dynamics NAV that simply lets them better manage customer contracts, recurrent on-site services, invoices, and inventory. With Pestsoft, the Austrian software manufacturer nector offers an optimum supplement for Microsoft Dynamics NAV. The software presents the data stored in NAV in a comfortable interface with a comprehensive documentation system for managing the documents for contracts, audits,training certificates forservice technicians, and above all a clear reporting system. Pestsoft also enables trend analyses and evaluations of selected periods. 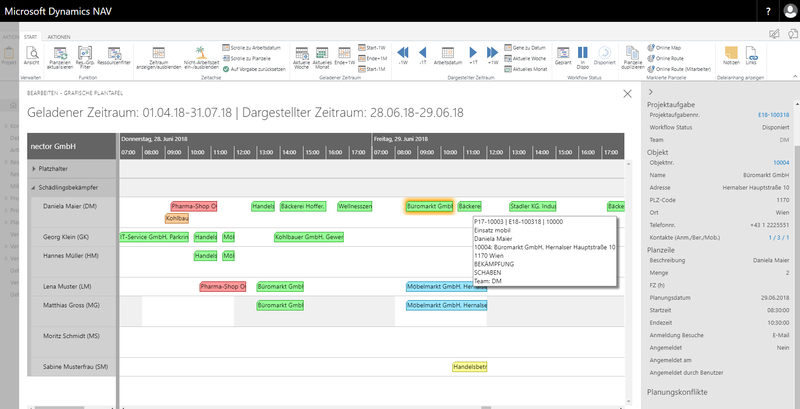 NETRONIC only needed six weeks for developing a Gantt widget that nector integrated into their Pestsoft solution. The result is an overview of orders and resources with a lot of functions supporting the pest controllers with their planning. The different workflow states like “planned”, “disposed”, “finished”, “technically released” are indicated by differently colored bars for a better overview. Selecting a planning line will open an infobox at the right edge showing more details of the deployment and also explanations of planning conflicts like date, capacity and quality conflicts. A tooltip appears when hovering with the mouse above a bar, giving additional information on the deployment. Feedback of the service technicians will directly be displayed in the planning line thus also allowing for a review of the IS data of the past. Accepting short-term orders gets ensured by creating placeholder resources in NAV containing predefined allocation aids like kind of service order, qualifications etc. In the planning table, the planning line can then be moved onto an appropriate free resource by drag and drop. The second expansion stage will bring a deployment backlog which will enable the planner to directly drag and drop unplanned orders to a free capacity of an employee. 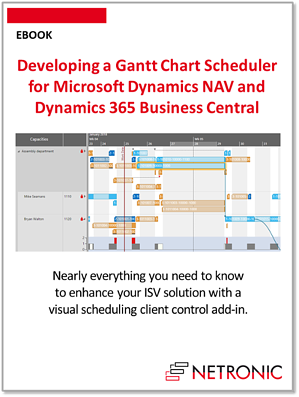 Learn more about Dynamics NAV HTML5 Gantt chart widgets that seamlessly integrate into your ISV software. Get our free Ebook about enhancing your ISV solution with a visual scheduling client control add-in.